Thanks to online poker, there is a whole generation of young British poker players who are at world class standard and able to compete at all levels in live tournaments, sit ‘n’ go and online. A perfect example of the new style of UK player is James Akenhead who was born in London in 1983. James was the first, and to date the only, UK poker player to make the November 9 in the World Series of Poker (WSOP) main event. The WSOP takes place during June and July, but the final table of the main event is postponed until November, and the 9 players remaining are known as the November 9. Unfortunately James held the shortest stack and was unable to progress higher than ninth place in the final, but still it was a great achievement and it made him one and a quarter million dollars. That was his second important achievement at the WSOP. In 2008 he finished second in a $1,500 Hold’em event winning a little over half a million dollars. James also made the final table in the 2009 World Series of Poker Europe (WSOP) main event and again he was eliminated in ninth place and collected a further sixty six thousand pounds in prize money. In the same year he won the 2009 Poker Million tournament in London and pocketed another half million Euros. 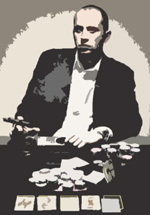 He has also demonstrated his prowess at online poker playing at poker rooms such as poker.betfair.com. Playing under the name of Asprin 1, in 2012 he won a major online tournament called the Sunday Million, which started out with over 7,000 players, winning nearly two hundred and twenty thousand dollars. When he is not playing poker you can often find him at a snooker or pool table or just chilling out listening to his favourite artist, the singer and song writer Bob Dylan, and dreaming of his as yet unfulfilled ambition of winning the WSOP. Roulette is extremely popular casino game. It has reached even greater popularity since the online casinos and respectively online roulette game entered our life. Glad you came to my site. I'm Brandon Brooks - professional poker player. When the people discuss how can man be so outwardly restrained I answer that I'm the same inside, it's easy when you have 15 year experience in investment companies and had to watch Dow Jones is jumping like a crazy fox. There you've got just two choices: stay cool or lose clients' money and be fired. That's how the real poker face can be trained. So I am. Former trader and now great pro player. Copyright © All Rights Reserved 2003-2019 pokerbonusgiant.com, a pokerbonusgiant.com project.